This book examines rural poverty in Bangladesh. 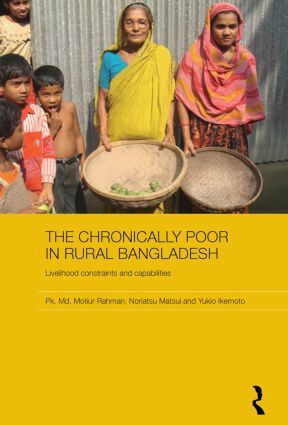 Based on detailed empirical research and surveys of households in Bangladesh, it provides an accurate portrait of the everyday situations faced by the rural poor in Bangladesh today, covering all aspects of household behaviour. All of the key issues are explored, including health, nutrition, housing conditions, human capital, household asset and liabilities, gender issues, livelihood strategies, distribution of household income and expenditure, social capital, intergenerational mobility of the chronically poor, women’s mobility, shocks and coping strategies, and vulnerability to poverty. The book focuses in particular on the poorest of the poor households, the chronically poor, seen by many in the development community to be the core of the problem of poverty. It shows that the basic characteristics of the chronically poor households in rural Bangladesh are: more heavily female-headed households, higher dependency ratio of children in demographic composition, and dominated by lower levels of assets, shorter years of schooling and limited employment opportunity. Throughout, it draws precise conclusions on the basis of quantitative data, which makes this book an important resource for policy-makers and development practitioners, as well as students and researchers.